A Kickstarter-funded PC video game, The Banner Saga famously achieved its $100,000 funding target in just one day, eventually raking in seven times that amount. The game takes place in a Viking-inspired world, mixed with some elements of Game of Thrones-style fantasy, and received good reviews on its release in early 2014. Bizarrely, the makers of the Candy Crush Saga game app objected to its title, claiming it was “confusingly similar” to their own game. There’s no news yet on whether the makers of The Lego Movie Videogame also objected, over the confusingly similar use of the word “the”. 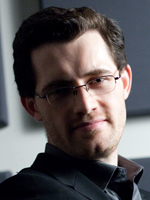 Raising such a large budget allowed the composer Austin Wintory to use an orchestra for his score. Wintory has combined his work in film with composing for video games over the last few years and his score for 2012’s Journey became the first video game score to be nominated for a Grammy (and I found it to be an extraordinary work, profoundly moving, my favourite album of any kind from that year and the finest music I’ve ever heard from a video game). The Banner Saga is another highly mature, highly impressive work. The plaintive “We Will Not Be Forgotten” which opens the album introduces the main theme – lonely, cold, but with an in-built heroism that will be developed throughout the score. The cold feeling permeates throughout – Wintory’s choice of ensemble is the Dallas Winds and the lack of strings (except for a violin soloist) brilliantly conveys the desired feeling. The music has a stark, harsh, at times brutal sound which takes no prisoners whatsoever: it is embellished with an eclectic array of soloists, including electric guitar and the unique timbre of the didgeridoo; and distinctive, arresting vocal solos, singing in Icelandic. To peddle out an old cliché, the album feels like a real musical journey, from that noble opening through some abrasive action (the composer leaves no doubt at all that things are really not very pleasant), mournful reflection and just occasionally the merest glimmer of warmth and hope – the first major ones of these doesn’t arrive until about half an hour into the album, the brilliant “Walls No Man Has Seen” feeling like a soul-enriching glimmer of hope to the weary traveller. There’s a gargantuan, ten-minute action cue late on (“Of Our Bones, the Hills”) which is truly spectacular. The conclusion, “We are all Guests upon the Land” is nothing short of epic. There’s phenomenal technique on display here, musically and dramatically. The former requires someone more intelligent than me to discuss in any worthwhile way but the latter is within my limitations – the morphing of sound from the bleakness that dominates earlier portions through those aforementioned shimmers of light into more optimistic sounds is beautifully plotted. Taylor Davis’s violin solos add that dose of humanity, playing a more and more prominent role as the score progresses; some of the vocals are passionately soulful (I love the brief “On the Hides of Wild Beasts” and the concluding song “Onward”). The Banner Saga is not as immediately accessible a piece of work as Journey, but after spending some time with it I found myself being drawn comprehensively within its spell. I’ve been so impressed by everything I’ve heard by Austin Wintory – every note feels like it meant something to him and that passion can’t help but be transferred through to the listener. There’s no scoring-by-numbers here. This is another impressive piece of work, both rich and rewarding. It’s the sort of music you’d hope (though not expect, given it’s 2014) to hear within something like Game of Thrones, but don’t – emotionally mature, dramatically literate, compositionally impeccable. It deserves a wide audience and I’m delighted to see the game has a sequel coming – it will be great to hear the composer return to this world. I noted a subtle dig at Djawadi’s Game of Thrones scores in there. Do you not care for them? I’ve never watched the show or heard an album, I’m just rather curious. I do not care for them in any way. Fantastic score; one of the best video game scores of the year so far. Wintory seems to nail everything he puts his time towards.